Preheat oven to 375°F. In a blender, process half-and-half, eggs, vanilla and 2 Tbsp. butter until smooth. Blend in flour, salt and 1/4 tsp. cinnamon. 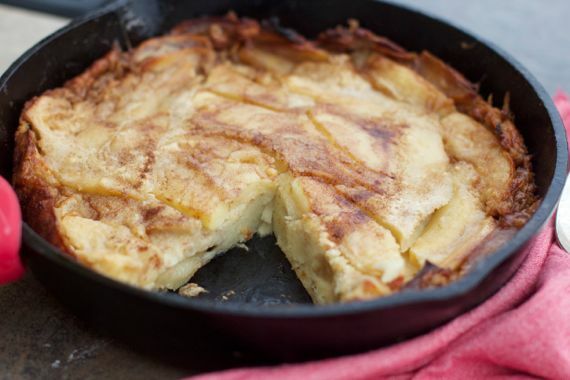 In a 10-inch nonstick skillet, mix remaining butter and cinnamon with brown sugar and lemon juice. Bring to a boil over medium-high heat, stirring. Stir in apples, reduce heat to low and simmer, stirring often, until apples are tender and liquid has thickened, about 7 minutes. Pour batter from blender over apple mixture; sprinkle with nuts, if desired. Bake until set and top is golden, 25 to 30 minutes. Sprinkle with confectioners’ sugar, if desired.